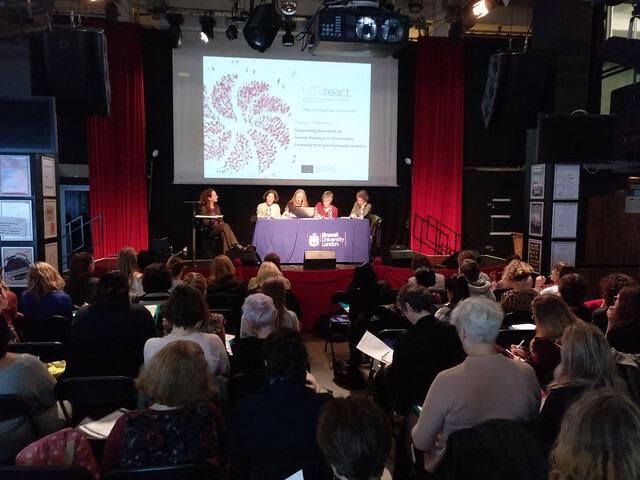 The #USVreact project European one-day Findings Conference took place in London on Thursday the 9th of November 2017 at Rich Mix. You can read the final project report here. speakers’ Biographies here, and feed-back from participants here. 11:45-12:45 Interactive Panel: Changing campus cultures to support equality and prevent violence. Alison Phipps (University of Sussex, UK) no PPT used. Antigone Lyberaki (Dept of Economics & Regional Development, Panteion, Greece) no PPT used. frame sexual violence and disclosure. USVreact partners present their country context and share their experiences. Chair: Jokin Azpiazu (UPV/EHU, Spain). 3:15- 4:30 Workshop sessions: New training models for university staff: What worked for us. Interactive sessions sharing the learning from the local USVreact interventions. 4:30-5:30 Plenary: What have we learned today? Print the conference programme from here. Download the conference flyer here.